As Christmas approaches I realize more and more what I am missing this holiday season. Its the little things I miss, like keeping Alexander from pulling things off of the Christmas tree, going shopping for presents, taking pictures in a cute little outfit, and hearing everyone coo over how cute, smart, and big he is. Every parent who has a baby at home spends so much time trying to get their baby to stop crying and all I want is to hear Alexander cry. I want to change dirty diapers and deal with a snotty nose. I want to worry when he doesn't feel good and complain about sleepless nights. I want to know whether he'd be just beginning to pull himself up on things or if he'd already be walking. I want to hear his first word. And yet I have this peace about it. A peace that doesn't make any sense. That peace that people talk about that surpasses all understanding. A peace that only can come from God. I had this same peace as I was going through all the waiting and the labor of birthing Alexander, knowing he was dead. It was the hardest thing I've ever had to do and yet I knew I wasn't alone. I had my husband, my parents, my pastor, and doctors and nurses with me. I knew I had all sorts of people praying and thinking about us, and I knew that God was with me. I could have peace when my world turned upside down and things didn't make sense because I knew from the moment that Alexander's spirit wasn't on earth, that he was being held by my lord and savior. Peace isour gift from Him. Not a worldly peace but a peace in our very core. I know Alexander is celebrating Christmas this year in heaven. Which quite frankly must be the biggest and best birthday party ever. I rejoice that he never knew pain or sorrow and that he was never sick. I have an Alexander shaped hole that won't be filled until we are reunited but I also have peace. 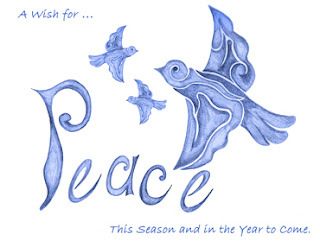 My wish for all of you this Christmas is that you find the Peace that has no rhym or reason in your heart.